"What is good for General Motors is good for America." FOR almost twenty years General Motors, GM, was the largest company, not only in America, but in the entire world. GM sat on top of the Fortune 500 companies for so long during which there was "no vacancy" at the top. All the other contestants were vying only for second place. Today GM is no longer the company presidents fear to offend. Others have taken the coveted top spot. Nigeria also had its own "GM" for decades. It was called the United African Company, UAC. Until the early 2000s, UAC was the leader of the Nigerian Organised Private Sector, OPS. Its shares quoted on the Nigerian Stock Exchange, NSE, constituted about 30 per cent of the value of the stock market. At the peak of its prowess, UAC had up to 40 Divisions; some with several branches. No government, military or civilian would contemplate an economic policy measure without consulting the Chairman/Managing Director of the UAC - before the Buhari regime in 1984-5. Buhari altered the relationship between the leadership of the OPS and the Federal Government. Nigeria is still paying for that drastic mistake till today. More pages are needed to explain how that delicate balance of powers prevented economic disasters before 1984-5 than is available now. It is merely sufficient to point out that a year after the Buhari/Idiagbon regime sidelined the OPS and UAC, thereafter the country went into its first recession since independence in 1960. For every folly of their princes, the Greeks feel the lash--Horace, 65-8 BC. And for every folly of their governments - federal state or local government - Nigerians are feeling the whip. And, the end to suffering is not in sight. Certainly not in 2019 which is already a disaster before the first month ends. Two prominent Nigerian chief executive officers, CEOs, of UAC during the period under review were Chief Abebe, the first Nigerian CEO and Chief Ernest Shonekan, GCFR. While the Head of State, civilian or military ruled the polity; they virtually ruled the economy. To some extent, it could be said then that "what was good for UAC was good for Nigeria." At the very least, it was the largest private employer of labour - directly or indirectly. That today UAC is no longer the largest company in Nigeria, either in terms of turnover or jobs was mainly brought about by Federal Government policy measures which transferred the vast majority of UAC's businesses depending on imports to local businessmen - usually party members or those close to the corridors of power. Whereas UAC, as a company with reputation to protect would import television sets and other appliances and pay correct duties, smugglers were allowed to bring in the same items, bribe Customs staff and openly display and sell their imports at a cheaper price. The first UAC Division to feel the lash was Kingsway Stores - the first supermarket in Nigeria. Successive FGs made sure that Kingsway was liquidated. Its first store at Marina reminds those old enough of when Nigeria had a government in the real sense of the word. Those who do not remember the past are condemned to repeat it--George Santayana, 1863-1952. Moving fast forward one can observe that history is about to repeat itself. In the last ten years or so, the Dangote Group of Companies, DGC, had become the largest group on the NSE. For years, they moved the stock exchange forward - just as UAC did in its heydays. They made money and the investors in DGC were happy to be on board. In the process, Alhaji Aliko Dangote, perhaps the most patriotic Nigerian alive, rose to become one of the top 25 richest people on earth and the richest African. To be honest, I was proud of him. There are very few positive measures of success known to man in which an African, and a Nigerian for that matter, ranks top 25. It was an achievement worthy of national celebration. To me the national honours given him was not enough. He had done more for Nigeria than all our post-Independence national leaders - except one. But, there was always that fear that another FG might do to DGC what was done to UAC; that those who once invested heavily in DGC would not suffer the same fate as those who slaved to make UAC great. Unfortunately, that is precisely what might be happening now. The latest Forbes list of the world's richest people was heart-breaking. Dangote is now down to 100 richest and he has lost money - virtually all of it here in Nigeria. To non-economists, it might appear as if this is crying more than the bereaved. That is understandable. What they fail to realise is that Dangote, Adenuga, Otedola etc listed among the world's richest invariably attract Foreign Direct Investment, FDI, to Nigeria which the rest of us cannot. And, the richer they are, the more foreign investors want to discuss investment opportunities in Nigeria with them. Certainly, nobody needs to be told that a nation which acquires the reputation of making its business people poorer will find it extremely difficult to convince most foreigners to invest in its economy. The economist ... must concern himself with the ultimate aims of man --Alfred Marshall, 1842-1924. Those consumed by envy might not understand why a "thousandnaire" would worry about the problems of a dollar billionaire. That is where professional economists differ from our Fellow Countrymen. The injunction from one of the founding fathers of our profession was not for us to concern ourselves with our own economic aims and objectives. It did not even enjoin us to strive to be rich. Instead, it was an admonition to economists to take care of the greatest number of their fellow citizens. That means drawing attention to those events which might have long term negative repercussions for the nation. 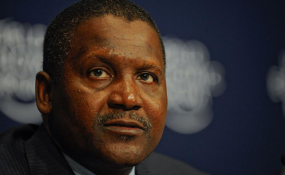 To be quite candid, Dangote represents only a pervasive problem with the Nigerian economy. There are several hundred others caught in the vice-grip of uncertainty regarding when the Nigerian economy will again grow at six to seven per cent a year. This year is out of the question. The 2019 Budget delivered two days before December recess by the National Assembly, NASS, and in the middle of campaigns, will not be signed until at least May this year. The appropriations are less than the 2018 budget which will result in, at best, two per cent growth. The World Bank, the International Monetary Fund, IMF and other global organisations predict 2.2 per cent for 2019. With population increase still racing at about three per cent, Nigeria will add about five million to its poor population. Per capita income will drop a bit more and so will purchasing power. Dangote and other patriotic Nigerian entrepreneurs have done their duty by Nigeria. They have sown joyfully; but they are almost harvesting in tears. If they stop, everyone in Nigeria will be in real trouble - not just people in Borno, Katsina and Zamfara States. The most important question now is: For how long must misguided government economic policies ruin our nation while we do nothing? This year like others has only twelve months. At least five will be spent with nobody thinking about how to prevent more deterioration. The remaining seven months cannot possibly reverse the accumulated damage - unless a new and radical solution is found.